Endemic Typhus Fever is usually spread by fleas and it has caused more deaths in human history than all wars put together. Endemic Typhus fever is caused due to two types of bacteria: Rickettsia typhi or Rickettsia felis. Both of these bacteria are normally found in rats. Fleas act as carrier of these bacteria. They carry it from rodents to humans with their bite. Therefore unhygenic places are best playground for Endemic Typhus Fever. Due to this reason this fever is also know as Jail Fever. Another type of typhus known as Epidimic Typhus is spread by body lice and as its name suggests it spreads after wars and natural calamities. Symptoms of Endemic Typhus Fever are visible after 6 to 14 days of Infection. Its symptoms are common to several other diseases, so its hard to diagnose it on the basis of physical symptoms. Some of the symptoms of Endemic Typhus Fever are body aches and pains, headache, chills. A visible rash on chest, back, arms, legs can also appear as a symptom. 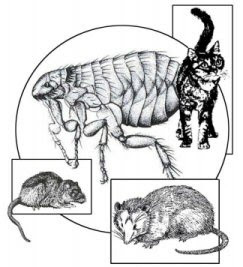 The rash is the primary point of infection, through where the flea infected your body. For a confirmation it better to get your blood tested for its bacteria. If the test is positive then most probably doctor will advise you to get admitted. This fever can be treated by appropriate antibiotic therapy. Antibiotics such as Doxycycline, Tetracycline and Chloramphenicol are used for treatment. The doctors can correctly prescribe the correct antibiotic for you. Tetracycline is avoided in children as it can stop the growth of permanent teeth. Sometimes the patient may need oxygen and intravenous fluids. If proper treatment of Endemic Typhus Fever is not done then it is a life threatening condition. A person who was earlier had Endemic Typhus Fever may again shown mild symptoms of this fever in elderly age (years after first infection). This is called Brill-Zinsser disease. In this disease the bacteria becomes active again. Infected fleas can pass the bacteria to their offspring for next 17 generations. Cat can also get infected by bacteria responsible for Endemic Typhus Fever without showing any symptoms. Fleas from cats can also spread this disease very easily. Rats, opossums and cats can help in spreading this disease. So in case of any outbreak of this disease, its better to stay away from these animals. Living in hygienic environment is the key to stay away from Endemic Typhus fever.